Morice Square Baptist Chapel of was situated in Morice Square, at the junction with King Street. Morice Square Baptist Chapel, Devonport. 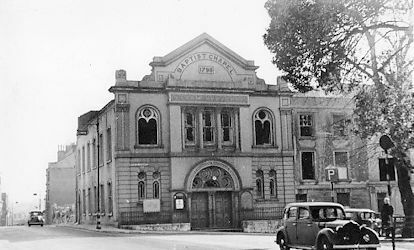 When the congregation at the Pembroke Street Baptist Chapel outgrew those premises as the population of Plymouth-Dock expanded, the pastor, the Reverend Isaiah Birt, took over the old Wesleyan Chapel in Morice Square. It was opened for Baptist worship on February 25th 1798. At first the two congregations shared the organisation but in 1800 they split. A further split occurred in 1852 when the Reverend T Horton left to set up the Hope Baptist Chapel in Fore Street. A Sunday School in connection with Morice Square Baptist Chapel was opened on Sunday January 14th 1872. It was erected by Messrs Dinnick and Hosking at the cost of £575. Mr Kestill was clerk of works. Mr C Dinnick entered into a separate contract for the fittings and fixtures at a cost of £55. Including the cost of purchasing the site, the total cost of providing the schools came to £920. Financially, the organisers were very well off and at the time of opening they had still to find only £250. As usual a public tea was laid on in the evening, which around 150 people attended. In 1902 some members of the congregation founded the Saint Budeaux Baptist Chapel. Morice Square Baptist Chapel was destroyed in the Second World War and it was decided to replace it by constructing a new chapel on one of the new housing estates. A site on the Ham Estate was purchased in 1946 and in January 1949 twenty members met for evening worship at Trelawny Secondary Modern School. On Wednesday July 8th 1953 the Lord Mayor of Plymouth, Alderman Sir Clifford Tozer, laid the memorial stone for a new chapel hall and classrooms in Ham Drive. The Reverend I E Thomas presided. Miss Margaret Salvage presented the Lady Mayoress with a bouquet of flowers. The new Chapel Hall was designed by Messrs Louis de Soissons and Partners and the contractors were Messrs John Garrett & Son Ltd. It was opened for worship on Wednesday June 30th 1954, with the Reverend Gwynfryn C Thomas as its first minister. The opening was performed by the Reverend C Dyer, secretary of the Devon and Cornwall Baptist Association and the building was dedicated by the Reverend H H Pewtree, general superintendent of the Western Area of the Baptist Union. To cope with the increasing numbers, a church hall was erected by the men of the Chapel, under the direction of a local builder, Mr F Handley. It could seat 120 people and was opened in February 1959. Finally, in April 1960 by the men of the congregation laid the foundations of the Chapel itself and built the walls up to the damp course level before handing the job over to Messrs EBC and Sleemen Ltd, of Exeter. The Chapel was designed by Mr Richard Fraser ARIBA of Messrs Louis de Soissons, Peacock, Hodges, Robertson and Fraser. Morice Baptist Chapel (it had dropped the "Square" by now) was formally opened and dedicated by the Reverend Thomas on the afternoon of Saturday January 13th 1962.